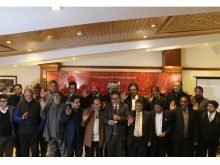 Skål International India has opened its 12th club under the name Skål International Srinagar that will comprise members from Jammu as well as Ladakh. Comprising 21 members, Ibrahim Siah is the founder President of the club, with an ever efficient, energetic secretary Nasir Shah. The chief guest for the Chapter night was Syed Abid Rasheed Shah, District Development Commissioner, along with other dignitaries —Saleem Baig, Mahmood Shah and Rakesh Gupta. The event was well-attended by the Skål India National Board and All India Club Presidents/Representatives and was hosted by ITC Fortune Heevan.